Governor Inslee has rejected the Tesoro oil terminal in Vancouver! Washington Governor Jay Inslee rejected the largest oil shipping terminal proposed in North America as not in the best interests of the state and its people. The Tesoro Savage project sought to ship over 131 million barrels of oil per year down the Columbia River, causing up to five, mile-and-a-half long oil trains to pass through Spokane, the Columbia River Gorge, and the City of Vancouver every day. 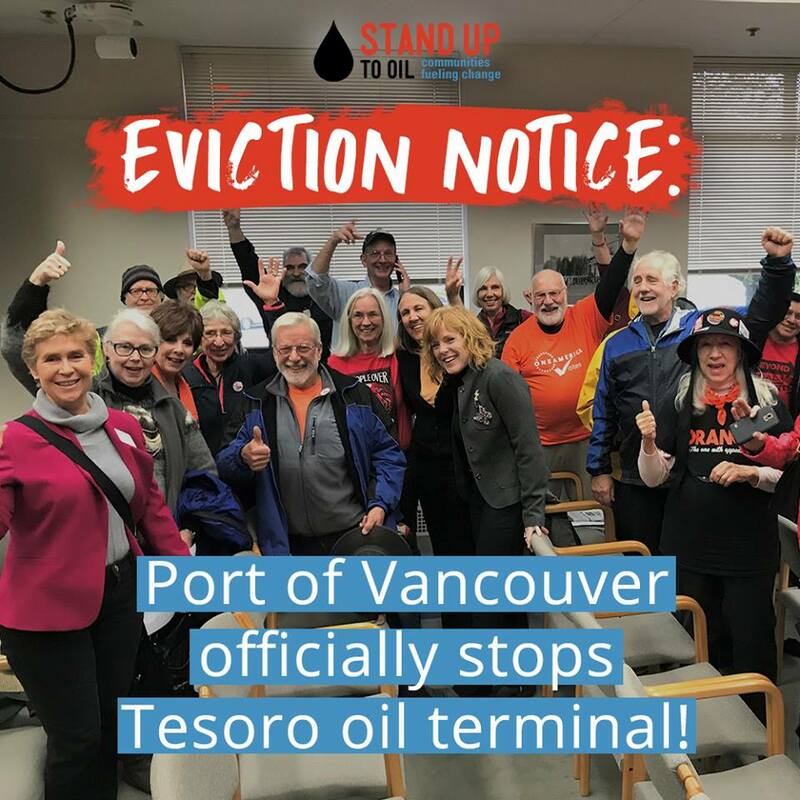 The Port of Vancouver Commission voted unanimously to end the Tesoro Savage oil train terminal proposal in Vancouver, Washington. Port of Vancouver Commissioner President Eric LaBrant issued the motion to exercise a clause which cancels the lease for the terminal effective March 31, 2018. The Commission took the vote in front of an overflow crowd, with many audience members testifying in support of the Port’s decision to terminate the largest oil-by-rail terminal proposal in North America. Unanimous Rejection of the Oil Terminal: Now Gov. Inslee Has Final Call! The Washington Energy Facility Site Evaluation Council (EFSEC) unanimously recommended denial of the Tesoro Savage oil terminal in Vancouver, Washington. 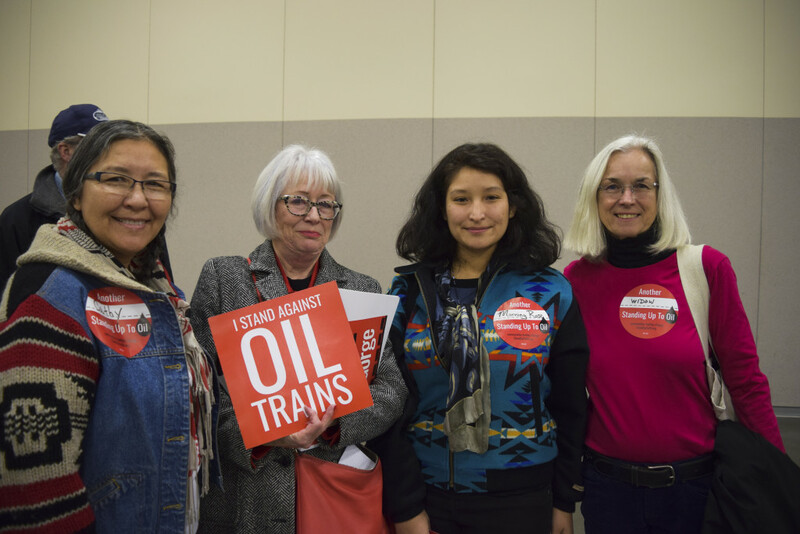 The final decision falls to Governor Jay Inslee, and community leaders from around the region are calling on Governor Inslee to deny the proposal swiftly, ending a four-year saga over the massive, 360,000-barrel-per day oil train terminal. A final written recommendation will be issued on December 19th. For more information on the FEIS, read our overview here. Take action today >> Tell Gov. Inslee to stop the largest oil terminal in North America! 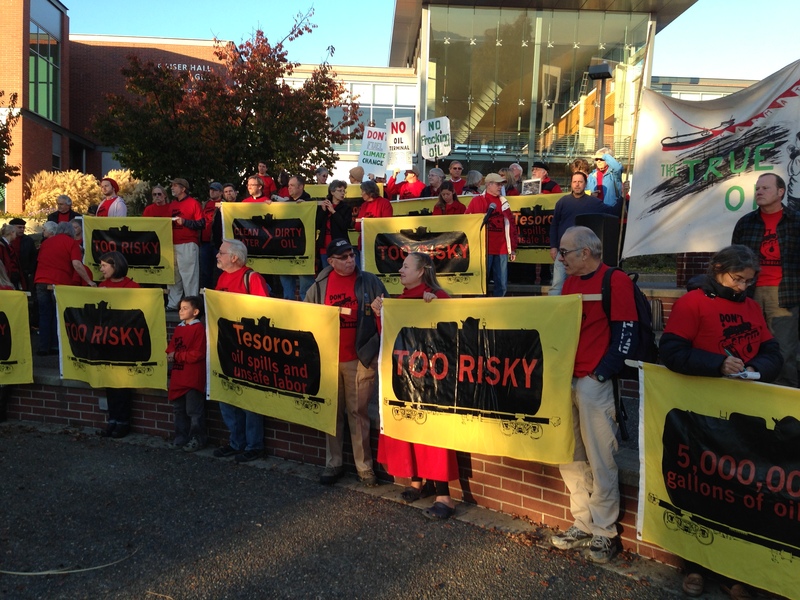 Take Action: Tell Governor Inslee to deny Tesoro! Hundreds oppose the oil terminal proposal at the final hearing! 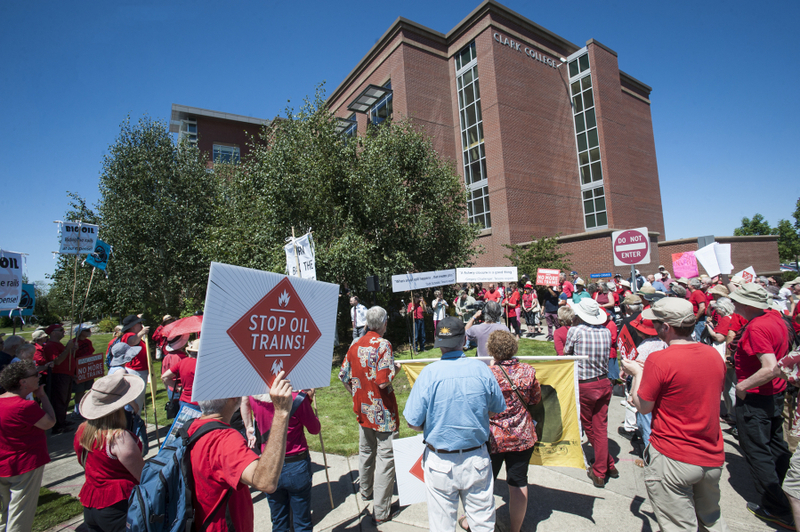 On June 7th, Washington’s Energy Facility Site Evaluation Council held its final major public hearing on the Tesoro Savage oil-by-rail terminal, with over 200 attendees during the rally and 300 attendees throughout the day. Activists urged Governor Inslee and EFSEC to deny the largest proposed oil terminal in North America. 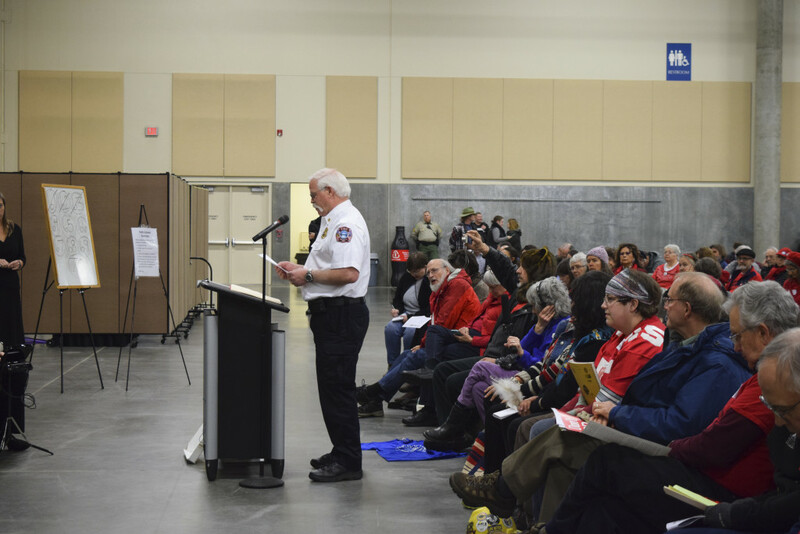 EFSEC collected public comments on the draft air pollution permit for Tesoro, and was likely the public’s last chance to weigh in before EFSEC makes a final recommendation to Governor Inslee. Read the full press release, see more photos, and read news coverage here! Oil train terminals are major sources of toxic air pollution. Tesoro would release smog-forming volatile organic compounds (VOCs), diesel exhaust, carbon monoxide, nitrogen oxides, and other pollutants linked to increased cancer rates. Tesoro Savage is tries to downplay this impact. Here’s where you come in: Tell EFSEC not to sacrifice the health of Vancouver’s residents, schoolchildren, and businesses for Tesoro’s massive oil-by-rail scheme. Read our Factsheet to learn more about the air pollution impacts of Tesoro’s proposed terminal. – Expert testimony of Dr. Sahu regarding volatile organic compound and carbon dioxide emissions. – Export testimony of Dr. Elinor Fanning on the health implications of Tesoro’s air pollution. – Fact sheet about Tesoro air pollution. 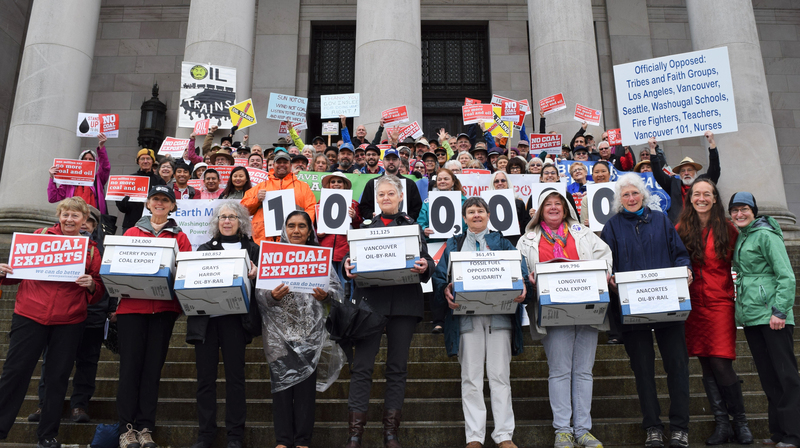 One million statements to protect the Pacific Northwest from oil and coal exports were delivered to Washington State Governor Jay Inslee. 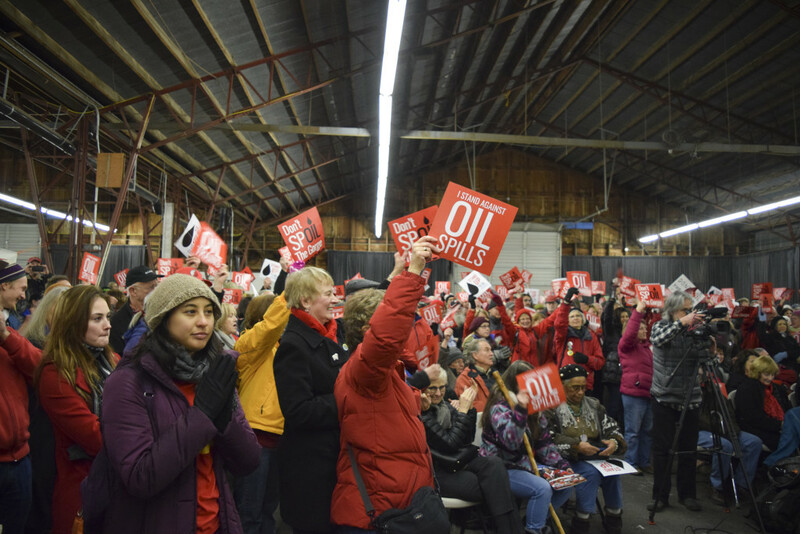 Communities across the PNW are rallying to say no to these dirty fossil fuels – we can do better! In the course of a 21-day hearing on the Tesoro-Savage proposal, over 80 witnesses were called to testify on subjects ranging from oil spill risk, train derailments, seismic hazards, emergency response, air emissions, public health impacts, community concerns, tribal fishing and cultural sites, harm to the Columbia River and its fish, insurance, and oil economics. 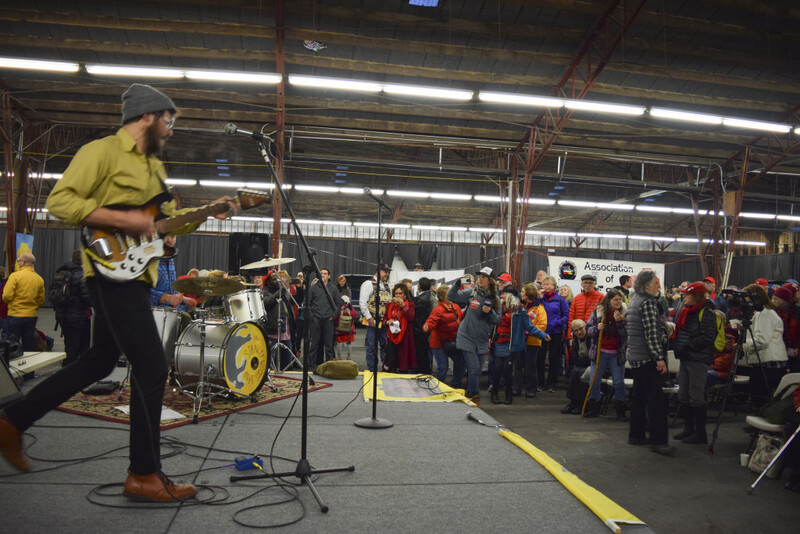 This five-week intense period was in preparation of the review board, called the Energy Site Evaluation Council (EFSEC), providing Governor Inslee a recommendation on the terminal. Two state-wide elected leaders recommended a denial of this terminal during this process. On the final afternoon, after the lawyers gave closing arguments, the public had another chance to weigh in. 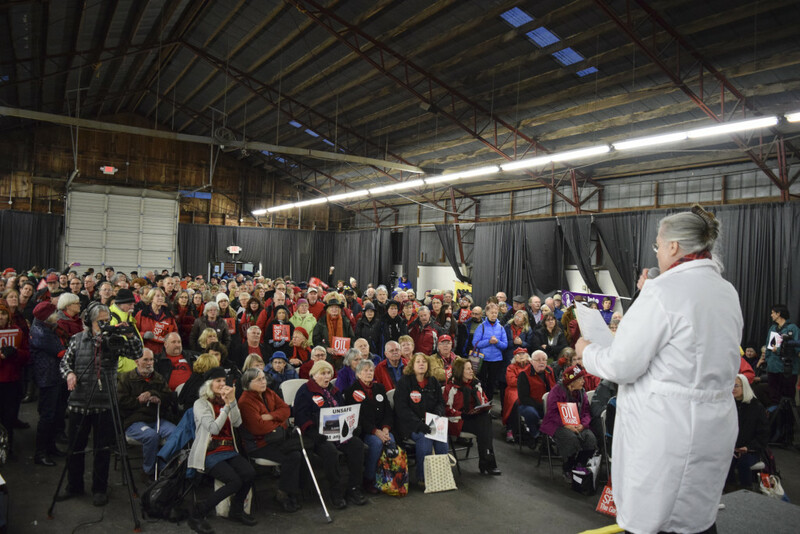 Over a 100 community members gathered to voice their concerns against the proposal at a rally; many then spoke directly to EFSEC. Thank you to all who shared their time and voices to stand up to this dangerous proposal! A huge thank you to Kristen Boyles and Janette Brimmer of Earthjustice who led the charge in presenting witnesses, pulling together expert testimony, crafting argument, and coordinating allied opponents – the Cities of Vancouver, Spokane, and Washougal, Clark County, the Washington Department of Natural Resources, Columbia River Inter-Tribal Fish Commission, the Umatilla and Yakama Tribes, the Washington State Counsel for the Environment, ILWU Local 4, Columbia Riverkeeper, Friends of the Columbia Gorge, Fruit Valley Neighborhood Association, Climate Solutions, Stand, Spokane Riverkeeper, Sierra Club, and Washington Environmental Council. In terms of next steps for the Tesoro-Savage proposal, EFSEC has a lot to review. We expect a recommendation by EFSEC to Governor Inslee sometime in mid 2017. We are also waiting for draft air and water permits, which will prompt public comment periods, the final state Environmental Impact Statement, and federal decisions by the U.S. Army Corps of Engineers. If you’re interested in watching some of the hearing, you can go here for daily hearing footage. The New York Times produced a great piece on the broad implications of oil transportation in Washington. Oregon Public Broadcasting broke the story that the groundwater in Mosier has been contaminated by the derailment. The Olympian ran a strong OpEd penned by members of WA’s Physicians for Social Responsibility highlighting the risks the project poses to vulnerable communities. The Columbian covered one of the most influential voices, the Attorney General’s, weighing in on the proposal. Record Comments Submitted on the Tesoro-Savage Proposal! The comment period is closed at this time. Tesoro-Savage would have impacts across the region – from oil spills to accidents along the rail and tanker route. The proposal could also deal a major blow to Vancouver’s economy and quality of life. The project is in direct conflict with a $1.3 billion waterfront redevelopment plan that would build 3,300 new homes, as well as restaurants, shopping and office space. Twenty-two city blocks of the waterfront development would be within 100 feet of the rail line. Tesoro Savage’s proposal is opposed by the Vancouver City Council, Vancouver Firefighters Union IAFF Local 452, ILWU Local 4, Columbia Waterfront LLC, the Cities of Washougal and Spokane, the Columbia River Inter-tribal Fish Commission, the environmental community, and people from all walks of life across the Northwest. Don’t miss our updates & breaking news! Sign up for our email list where you’ll receive news, information, and actions tailor just for you. Sign up here.